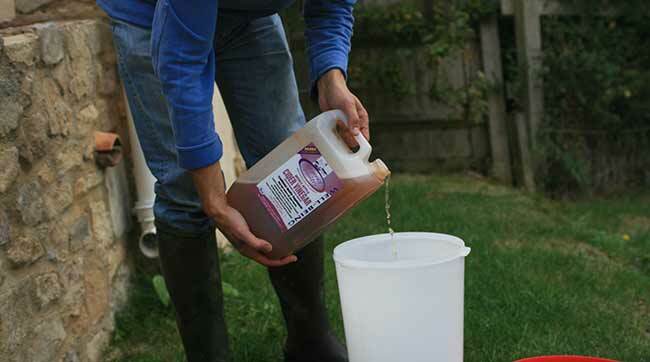 Home » Poultry Medication » Worming Chickens – Alternatives To Flubenvet? Worming Chickens – Alternatives To Flubenvet? The preferred wormer for chickens is Flubenvet. It kills all worms, including tape worm. This is currently the only licensed in-feed wormer on the market. As I write this (August 2015), the 60g packs of Flubenvet have been out of stock for a couple of months and we have been inundated with emails and posts in our forum from people trying to get hold of it to worm their chickens. I contacted my supplier who said the manufacturer doesn’t intend to produce more until March 2016 so it sounds as if it is going to be out of stock for some time. This article lets you know what’s still available and asks if there are any alternatives to Flubenvet that you can use. At the time of writing, there are still some 240g ‘Gamekeeper Packs’ available (but watch the sell -by date, it may only have 6 months shelf life like the stock my local supplier received). This weighs in at about £75 and can treat around nineteen 20Kg bags of feed, far too much for most backyard poultry keepers. In the absence of a licensed product, veterinarians will usually prescribe other products under their ‘clinical judgement’ that they feel will be effective. We have to point out at this point that it is only a vet who can advise you on using products on a non-target species, so you must contact a poultry vet for further advice on using alternatives (with the exception of Verm-X that is mentioned and according to the regulations, as a herbal product cannot be called a wormer but is being used for ‘natural control of intestinal hygiene’). What I have done here is gather some information that you may find useful to consider before discussing options with your vet. 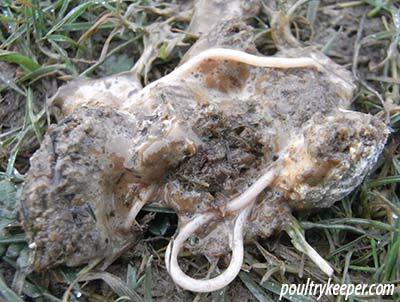 There are products licensed in other countries that are used to worm chickens and products used to worm other birds but are licensed under the Small Animal Exemption Scheme but are not licensed for use in food-producing animals such as chickens and not all of them kill all types of worms like Flubenvet. Worms are not always visible and infection can be asymptomatic. Affected chickens can suffer ill thrift, anaemia and even death. It can be hard for novices to identify worms but generally speaking, if your birds fall ill or starts coughing, you should be ensuring they have been wormed. It is wise to avoid birds getting impacted (full) with worms, since when this many worms are killed, toxins released into the body can kill the bird. Roundworm clearly visible in a dropping after being wormed. You can use a worm testing kit to check for worms, yet very few poultry keepers seem to do this, the majority preferring to worm chickens routinely twice a year in the spring and autumn, outside of the breeding season. I would encourage you to use a kit since drug resistance is a problem we’re all storing up for the future by using wormers routinely. Vets can identify worms under a microscope, however if you’re inquisitive like me, you can worm your birds and place some newspaper on the floor of the coop, and can usually see round worms in their droppings. Round worms are one of the most commonly found worms in chickens. The most popular alternative that I hear vets are using is Ivermectin Drops (Click Here to Buy) which are usually sold under the Small Animal Exemption Scheme for use in rabbits, Guinea Pigs and ornamental birds. They are dropped onto the skin (much the same as products that worm cats and dogs). Ivermectin does not kill all worm species. According to Victoria Robert’s book Diseases of Free Range Poultry, it does not kill tapeworm or fluke but fortunately these are not that common in poultry. Ivermectin also kills external parasites, (such as lice and northern fowl mite). Remember to follow your vets advice, you should not get Ivermectin on your skin so wear gloves. The recommended dosage for a pigeon is one drop on the skin once a week for 3 weeks. Your vet will tell you how many drops you should use based on the weight of your bird. A pigeon in typically 300-450g in weight so a small hybrid hen is probably going to be 2 drops and a large hen or cockerel 3 drops. We list typical weights of standardised breeds in our chicken breeds section. Wear gloves and wash your hands thoroughly with soap and water following treatment. There is more information on Ivermectin here in our medication section. Ivermectin can be bought online here but do remember to seek the advice of your vet. Other vermifuges that vets may prescribe are Pancur (this doesn’t kill gizzard worm eggs) and Levamisole but delivery is as a drench (squirting the liquid down the birds throat). This can be difficult with chickens and ducks and you need a syringe with a special attachment to do this. It is important to make sure you get the liquid down the throat and not into the airway. Because on this, you would need to take all of your birds to the vet, or ask the vet to come out to you. There is no information relating to the withdrawal period for eggs or meat following the use of these products since they are not licensed for poultry. When speaking to your vet for advice, if they prescribe one of these alternatives, you should seek their advice on a withdrawal period. Following a positive opinion from the Committee for Medicinal Products for Veterinary Use, the European Commission granted marketing authorization for PANACUR® AquaSol containing fenbendazole at 200 mg/mL for use in chickens. Let’s hope they will produce small enough quantity packages for backyard chicken keepers. At last another alternative to Flubenvet! With any herbal alternative, it is wise to conduct your own research which could involve getting a worm count kit and testing for worms after treating your birds. It is widely accepted in both human and animal products that there are natural or ‘traditional’ alternatives. If you take this view then freshly crushed Garlic and Apple Cider Vinegar (both can be given in water) are said to be beneficial to your birds and their intestinal health and may make the gut a less pleasant place for worms. If you read old poultry books, before wormers were available, a strong garlic solution was recommended to worm poultry. Adding Apple Cider Vinegar to a water drinker. Verm-X is well established as a ‘herbal intestinal hygiene’ product and has been around for a number of years now. The makers have received a number of awards for its efforts in producing natural products to support the welfare of animals. The regulations prevent the manufacturers from calling it a ‘wormer’, but it certainly seems to be gaining in popularity as a herbal product and ideal for those wishing to explore a natural route. POM-V Prescription Only Medicine - Vet. A medicine, to be supplied on prescription (orally or in writing) by a vet to animals under his care following a clinical assessment. POM-VPS Prescription Only Medicine - Vet, Pharmacist or Suitably Qualified Person. A medicine for food-producing animals (and horses), which must be prescribed by a vet, pharmacist or SQP (either orally or in writing). NFA -VPS Non Food Animal Medicine - Vet, Pharmacist or Suitably Qualified Person. A medicine for pets that has to be supplied by a vet, pharmacist or Suitably Qualified Person.